PI3K (Phosphoinositide 3-kinase), via phosphorylation of the inositol lipid phosphatidylinositol 4,5-bisphosphate (PI(4,5)P2), forms the second messenger molecule phosphatidylinositol (3,4,5)-trisphosphate (PI(3,4,5)P3) which recruits and activates pleckstrin homology domain containing proteins, leading to downstream signalling events crucial for proliferation, survival and migration. Class I PI3K enzymes consist of four distinct catalytic isoforms, PI3Kα, PI3Kβ, PI3Kδ and PI3Kγ. There are three major classes of PI3K enzymes, being class IA widely associated to cancer. Class IA PI3K are heterodimeric lipid kinases composed of a catalytic subunit (p110α, p110β, or p110δ; encoded by PIK3CA, PIK3CB, and PIK3CD genes, respectively) and a regulatory subunit (p85). The PI3K pathway plays an important role in many biological processes, including cell cycle progression, cell growth, survival, actin rearrangement and migration, and intracellular vesicular transport. 3-Methyladenine is a PI3K inhibitor. 3-Methyladenine is a widely used inhibitor of autophagy via its inhibitory effect on class III PI3K. LY294002 is a broad-spectrum inhibitor of PI3K with IC50s of 0.5, 0.57, and 0.97 μM for PI3Kα, PI3Kδ and PI3Kβ, respectively. It also inhibits CK2 with an IC50 of 98 nM. Wortmannin is a multi-target inhibitor of PI3K and MLCK with IC50s of 3 nM and 200 nM, respectively. Wortmannin is also a potent inhibitor of DNA-PK (IC50, 16 nM) and ATM (IC50, 150 nM). Wortmannin also potently inhibits Polo-like kinase (Plk). Alpelisib (BYL-719) is a potent and selective PI3Kα inhibitor with an IC50 of 5 nM. Buparlisib (NVP-BKM120) is a pan-class I PI3K inhibitor, with IC50s of 52, 166, 116 and 262 nM for p110α, p110β, p110δ and p110γ, respectively. SAR-260301 is a selective PI3Kβ inhibitor with an IC50 of 23 nM. BGT226 (NVP-BGT226) is a PI3K (with IC50s of 4 nM, 63 nM and 38 nM for PI3Kα, PI3Kβ and PI3Kγ)/mTOR dual inhibitor which displays potent growth-inhibitory activity against human head and neck cancer cells. PI3Kγ inhibitor 2 (Compound 16) is an orally bioavailable, CNS-penetrant, isoform selective PI3Kγ inhibitor with a Ki of 4 nM. Copanlisib (BAY 80-6946) is a selective and ATP-competitive class-I PI3 kinases inhibitor, with IC50s of 0.5, 0.7, 3.7 and 6.4 nM for PI3Kα, PI3Kδ, PI3Kβ and PI3Kγ, respectively. IPI549 is a potent and selective PI3Kγ inhibitor with an IC50 of 16 nM. Idelalisib (CAL-101) is a highly selective and potent p110δ inhibitor with an IC50 of 2.5 nM, showing 40- to 300-fold selectivity for p110δ over other PI3K class I enzymes. Quercetin, a natural flavonoid, is a stimulator of recombinant SIRT1 and also a PI3K inhibitor with IC50 of 2.4±0.6 μM, 3.0±0.0 μM and 5.4±0.3 μM for PI3K γ, PI3K δ and PI3K β, respectively. Dactolisib (BEZ235) is a dual pan-class I PI3K and mTOR kinase inhibitor with IC50s of 4 nM/5 nM/7 nM/75 nM, and 20.7 nM for p110α/p110γ/p110δ/p110β and mTOR, respectively. Dactolisib (BEZ235) inhibits both mTORC1 and mTORC2. Pictilisib (GDC-0941) is a potent inhibitor of PI3Kα/δ with an IC50 of 3 nM, with modest selectivity against p110β (11-fold) and p110γ (25-fold). SAR405 is a PIK3C3/Vps34 inhibitor with an IC50 of 1.2 nM. SAR405 prevents autophagy and synergizes with MTOR inhibition in tumor cells. 740 Y-P (PDGFR 740Y-P) is a potent and cell permeable PI3K activator. LY3023414 potently and selectively inhibits class I PI3K isoforms, DNA-PK, and mTORC1/2 with IC50s of 6.07 nM, 77.6 nM, 38 nM, 23.8 nM, 4.24 nM and 165 nM for PI3Kα, PI3Kβ, PI3Kδ, PI3Kγ, DNA-PK and mTOR, respectively. LY3023414 potently inhibits mTORC1/2 at low nanomolar concentrations. GDC-0077 is an orally available PI3K inhibitor with potential antineoplastic activity. GDC-0077 is extracted from patent WO 2017001645 A1, formula I.
Fimepinostat (CUDC-907) potently inhibits class I PI3Ks as well as classes I and II HDAC enzymes with an IC50 of 19/54/39 nM and 1.7/5.0/1.8/2.8 nM for PI3Kα/PI3Kβ/PI3Kδ and HDAC1/HDAC2/HDAC3/HDAC10 , respectively. Duvelisib is a selectivite p100δ inhibitor with IC50 of 2.5 nM, 27.4 nM, 85 nM and 1602 nM for p110δ, P110γ, p110β and p110α, respectively. Phosphatidylinositol 3 kinases (PI3Ks) are a family of lipid kinases that integrate signals from growth factors, cytokines and other environmental cues, translating them into intracellular signals that regulate multiple signaling pathways. 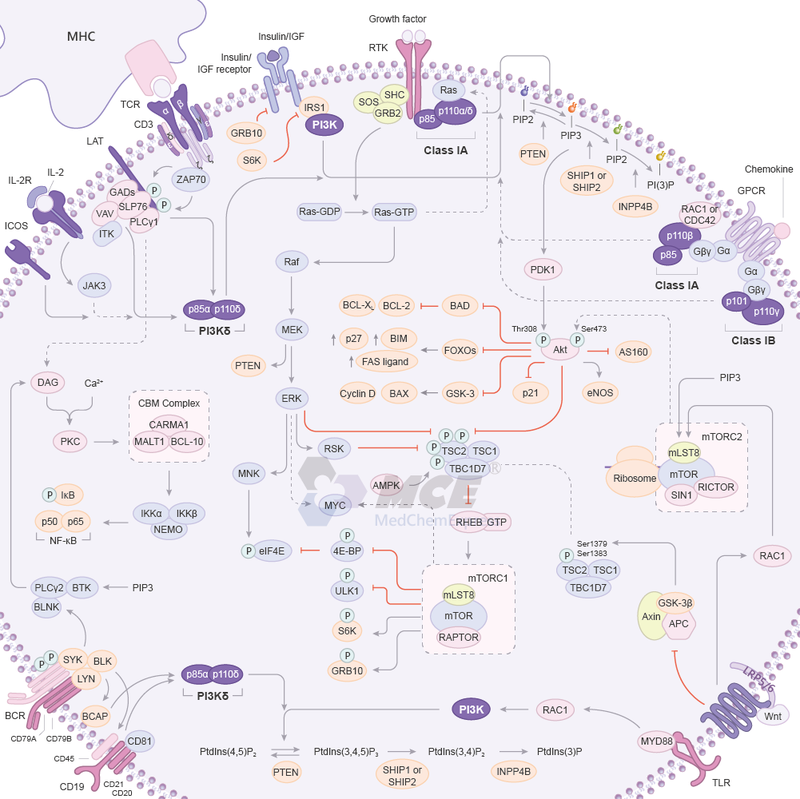 These pathways control many physiological functions and cellular processes, which include cell proliferation, growth, survival, motility and metabolism. In the absence of activating signals, p85 interacts with p110 and inhibits p110 kinase activity. Following receptor tyrosine kinase (RTK) or G protein-coupled receptor (GPCR) activation, class I PI3Ks are recruited to the plasma membrane, where p85 inhibition of p110 is relieved and p110 phosphorylates PIP2 to generate PIP3. The activated insulin receptor recruits intracellular adaptor protein IRS1. Phosphorylation of IRS proteins on tyrosine residues by the insulin receptor initiates the recruitment and activation of PI3K. PIP3 acts as a second messenger which promotes the phosphorylation of Akt at Thr308 by PDK-1. RTK activation can also trigger Ras-Raf-MEK-ERK pathway. Activated Akt, ERK and RSK phosphorylate TSC2 at multiple sites to inhibit TSC1-TSC2-TBC1D7, which is the TSC complex that acts as a GTPase-activating protein (GAP) for the small GTPase RHEB. During inhibition of the TSC complex, GTP-loaded RHEB binds the mTOR catalytic domain to activate mTORC1. Glycogen synthase kinase 3β (GSK-3β) activates the TSC complex by phosphorylating TSC2 at Ser1379 and Ser1383. Phosphorylation of these two residues requires priming by AMPK-dependent phosphorylation of Ser1387. Wnt signaling inhibits GSK-3β and the TSC complex, and thus activates mTORC1. mTORC2 is activated by Wnt in a manner dependent on the small GTPase RAC1. Akt activation contributes to diverse cellular activities which include cell survival, growth, proliferation, angiogenesis, metabolism, and migration. Important downstream targets of Akt are GSK-3, FOXOs, BAD, AS160, eNOS, and mTOR. mTORC1 negatively regulates autophagy through multiple inputs, including inhibitory phosphorylation of ULK1, and promotes protein synthesis through activation of the translation initiation promoter S6K and through inhibition of the inhibitory mRNA cap binding 4E-BP1. PI3Kδ is a heterodimeric enzyme, typically composed of a p85α regulatory subunit and a p110δ catalytic subunit. In T cells, the TCR, the costimulatory receptor ICOS and the IL-2R can activate PI3Kδ. In B cells, PI3Kδ is activated upon crosslinking of the B cell receptor (BCR). The BCR co-opts the co-receptor CD19 or the adaptor B cell associated protein (BCAP), both of which have YXXM motifs to which the p85α SH2 domains can bind. In lumphocytes, BTK and ITK contribute to the activation of PLCγ and promotes the generation of DAG and the influx of Ca2+, which in turn activate PKC and the CARMA1-, BCL 10- and MALT1 containing (CBM) complex. The resulting NF-κB inhibitor kinase (IKK) activation leads to the phosphorylation and the degradation of IκB, and to the nuclear accumulation of the p50-p65 NF-κB heterodimer. MyD88 is an adapter protein that mediates signal transduction for most TLRs and leads to activation of PI3K.
. Thorpe LM, et al. PI3K in cancer: divergent roles of isoforms, modes of activation and therapeutic targeting.Nat Rev Cancer. 2015 Jan;15(1):7-24.
. Vanhaesebroeck B, et al. PI3K signalling: the path to discovery and understanding.Nat Rev Mol Cell Biol. 2012 Feb 23;13(3):195-203.
. Fruman DA, et al. The PI3K Pathway in Human Disease.Cell. 2017 Aug 10;170(4):605-635.
. Lucas CL, et al. PI3Kδ and primary immunodeficiencies.Nat Rev Immunol. 2016 Nov;16(11):702-714.